10531 ESS F.S.A.T. (1960) Weddell seal*. Trial color proof pair in different colors. Scott No 18, Yvert No 16. Scott catalog for a single perforated is $75. Trial colors are very rare! 16520 ESS F.S.A.T. (1960) Sea lion*. Trial color proof. Scott No 17, Yvert No 13b. 1627 ESS F.S.A.T. (1963) Elephant seals*. Trial color proofs in strip of 3. Scott No 22, Yvert No 13c. 6767 ESS F.S.A.T. 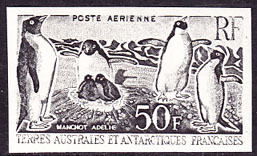 (1963) Adelie Penguins*. Trial color proof. Scott No C4, Yvert No PA5. 7569 ESS F.S.A.T. 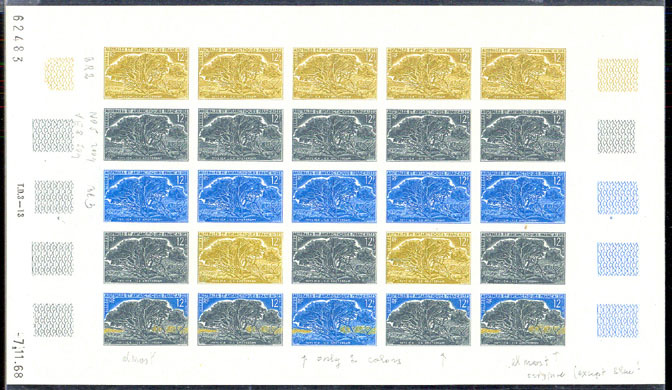 (1963) Elephant seals*. Trial color proofs in strip of 5 with multicolor. Scott No 22, Yvert No 13c. 15769 ESS FRENCH ANTARCTIC (1963) Penguins*. Pontoon boats*. Scott No 23. Yvert No 20. International Year of the Quiet Sun. Trial Color Plate Proof. 8466 ESS F.S.A.T. (1964) Sun*. Penguins*. Telecommunications towers*. Trial color proofs in margin strip of 5 with multicolor. International Quiet Sun Year. Scott No C6, Yvert No PA7. A spectacular item! 10101 ESS F.S.A.T. (1965) Discovery of Terre Adelie*. Trial color proof. Scott No C7, Yvert No PA8. 10102 ESS F.S.A.T. (1965) Discovery of Terre Adelie*. Trial color proof margin strip of 5 with color codes in margin. Scott No C7, Yvert No PA8. 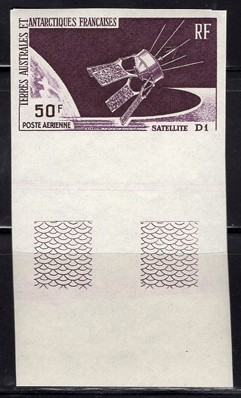 17251 ESS FRENCH ANTARCTIC (1966) D1 Satellite*. Trial color proof. Scott No C11. Yvert No PA12. 9255 ESS F.S.A.T. (1968) Eiffel Tower*. Albatross*. Ship*. Trial color proof full sheet of 10. Antarctic Treaty Powers meeting. Scott No C17, Yvert No PA18. Some adhesions in one margin on gum side. 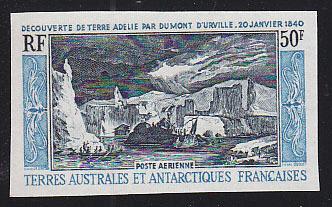 10103 ESS FRENCH ANTARCTIC (1968) Dumont D'Urville*. Ships*. Scott No 30. Yvert No 25. FULL SHEET OF 25 TRIAL COLOR PLATE PROOFS with color codes in pencil in the margin. Unusual combination of unicolor and multicolor Proofs on the 4throw (usually the 4th row consists of 5 identical unicolors, a repeat from one of the first 3 rows.) 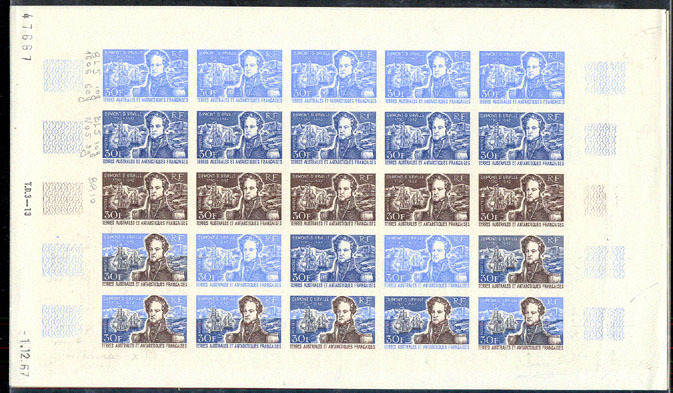 Also some of the multicolors are amazingly similar to the issued stamp. Ceres catalog for imperforates would amount to over $9000!! Amazing multiple! 11786 ESS FRENCH ANTARCTIC (1968) Human Rights flame*. Full sheet of 25 trial color proofs. Scott No 32. Yvert No 27. Dallay catalog for imperforate singles would be over $5000! Fabulous item! 15624 ESS F.S.A.T. 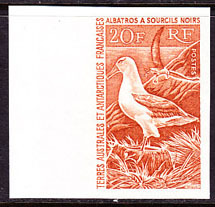 (1968) Black-browed albatross*. Trial color proof. Scott No 28, Yvert No 24. 16069 ESS FRENCH ANTARCTIC (1968) Ships*. Dumont D'Urville*. Scott No 30. Yvert No 25. Trial Color Plate Proof. 11700 ESS F.S.A.T. 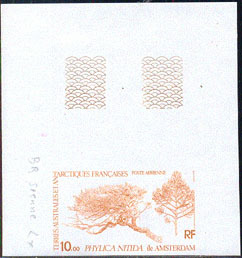 (1969) Phylica trees*. Full sheet of 25 trial color proofs, with interesting annotations in margin. Scott No 27, Yvert No 29. 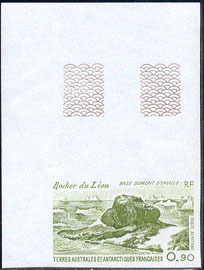 11746 ESS FRENCH ANTARCTIC (1970) New U.P.U. building*. Scott No 36. Yvert No 33. Trial Color Plate Proofs in strip of 5. **. 10163 ESS F.S.A.T. (1971) Trematomus hansoni*. Scott No 40. Yvert No 43. 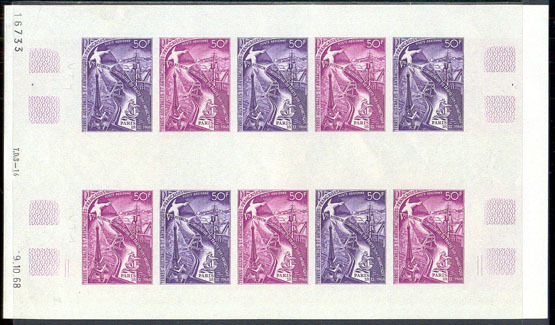 Trial Color Plate Proofs in strips of 5 with multicolor. 10164 ESS F.S.A.T. (1971) Zanchlorhyncus spinieer. Scott No 44, Yvert No 45. 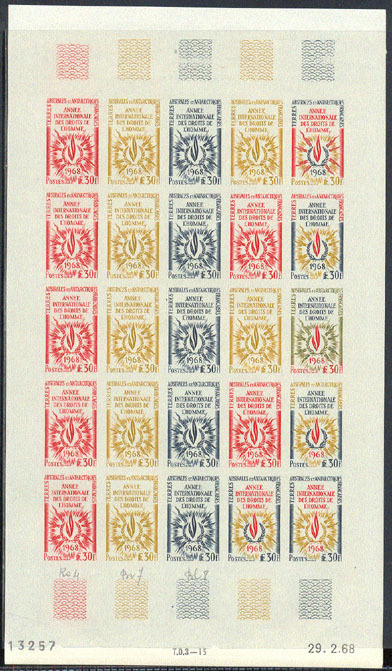 Trial Color Plate Proofs in strips of 5 with multicolor. 10167 ESS F.S.A.T. (1977) Salmon*. Hatchery*. Scott No 70. Yvert No 71. Trial Color Plate Proof pair. 7744 ESS F.S.A.T. (1979) Lion Rock*. Trial color proof. Scott No C57, Yvert No PA57. 8648 ESS F.S.A.T. (1979) Phylica nitida*. Trial color proof. Scott No C59, Yvert No PA60.